Which Real-Life Victorian Sub Inspired Jules Verne's Nautilus? When Jules Verne wrote about the fantastic submersible ship Nautilus in 20,000 Leagues Under the Sea, there had already been several very successful submarines built and tested. And Verne, who always did his homework, was certainly aware of these. Which was his inspiration? There was the fabulous Icteneo ("new fish"), invented by Narcis Monturiol and launched in 1864. Like the Nautilus, it was designed largely for undersea research, and even included a pair of large portholes in its flanks for observation. But this submarine didn't look especially like Verne's description of the Nautilus, nor was it very big, being only about 45 feet long. A full-size replica of the Ictineo can be seen in Barcelona. Another candidate often pitched as an influence on Verne was Le Plongeur ("the diver"), invented by Captain Simeon Bourgeois and launched in 1863, it was the first submarine to be powered by mechanical means: a compressed-air engine operating a reciprocating engine. It was also the largest submarine built up until that time. At 140 feet, it was only about 1/3 smaller than the Nautilus. It was armed with a torpedo held at the end of a long spar attached to the prow, similar to the weapon employed by the unlucky C.S.S. Hunley during the American Civil War. One unique feature the Le Plongeur shared with the Nautilus was a lifeboat set into a recessed socket in the deck. 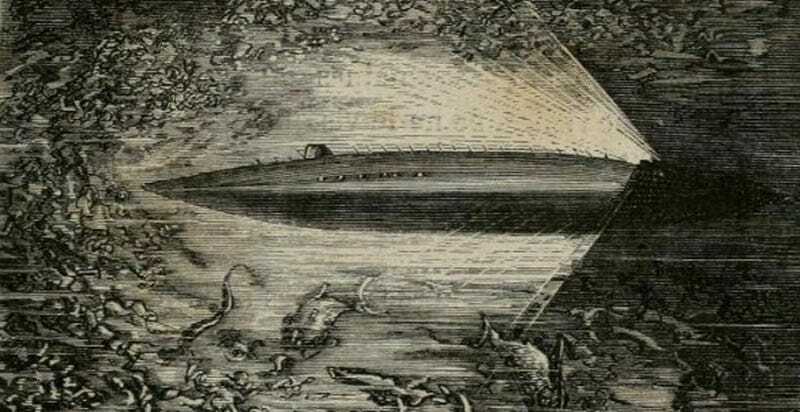 While Verne was of course influenced in general by the many submarine experiments taking place at the time he wrote his novel—and the Nautilus was in large part an amalgam that combined features from many of these—was any one particular vessel the direct inspiration for Captain Nemo’s fabulous sub? There is a very likely candidate that, ironically, was not a submarine at all. American inventor Ross Winans built the first of his remarkable "roller ships" at Ferry Bay, Baltimore, in 1858. Newspapers of the time rhapsodized how it “will inaugurate a new era in naval architecture.” It was certainly like nothing else afloat. It had no keel, no masts, no rigging...not even a deck (in lieu of which the ship had a flattened space about 16 feet long to which were riveted four settees). Instead, it was a streamlined cigar-shape. Perhaps its strangest feature was the ring-shaped propeller that circled the waist of the ship. Winans expected his ship to cross the Atlantic in four days...about half the current record time. He explained that he could do this because of the ship’s streamlining and lack of any excess weight. After the initial testing of the first ship, several more were built, including one for the Russian government. All suffered from the same problems: weak rudders, rolling and excessive water breaking over their bows. Nevertheless, one was described as having carried twenty passengers on "a fast run to England in 1859." Which must have been quite something. The low freeboard of the ship allowed even small waves to break over the deck, and there was nothing to prevent the ship from rolling, making it a nightmare for the seasickness-prone. After struggling with it for two years, Winans finally abandoned the annular propeller. The Russian ship was built in 1861 and, on Winans' advice, fitted with a more conventional stern propeller. This worked so well that two more ships were built, one of them tested on the Thames in 1864. Named the Ross Winans, it differed considerably from its predecessors. It was 256 feet long and had a flat deck 130 feet in length (the Nautilus was 230 feet long). It also had screws at either end. These were described as being "enormous fans that were but half immersed and hit the sea like flails when they revolved," recalling to mind the many references Verne made to the Nautilus' oversized propeller breaking the surface when the submarine was not submerged. This is a feature of the Nautilus not otherwise explainable. Two of Winans' cigar-shaped ships survived until just after the turn of this century, moored off the Royalty Pier at Southampton, England. The model, by the way, is a paper kit available here. It is based on my recreation of the Nautilus, which I did while working on the special edition of the novel I created for Unicorn Press. While working on the illustrations for that edition, I went over the text literally word-for-word, looking for anything that was even remotely related to the design and appearance of the submarine...right down to the exact number of steps leading up to Nemo's cabin (three) and the shape of the ram (its cross-section is an isosceles triangle). There were a lot of surprises. For instance, how much the "real" Nautilus resembles a modern nuclear submarine. Another surprise was that the big circular portholes in the sides—an iconic feature of virtually every depiction of the submarine—were in fact rectangular (something a modern engineer would balk at doing). Jules Verne often worked closely with his illustrators—occasionally even providing sketches and diagrams for them to follow. For instance, there is a surviving sketch of his flying machine, the Albatross, that he provided his illustrator, Leon Bennett. I strongly suspect he did the same for Alphonse de Neuville and Edouard Riou, the illustrators of 20,000 Leagues. There is a hint of this in one of de Neuville's illustrations. This depicts Captain Nemo explaining the workings of the Nautilus to Professor Arronax as he points outs out its features on a large schematic. Did the artist copy this from a diagram that Verne himself provided? Some of the vaguely hinted-at details do indeed match the actual layout of the submarine. I strongly believe that there was such a schematic: Verne's descriptions of the interior details are far too consistent for him to have not had such a plan. The most difficult part of Verne's description for me to work out was the operation of the pilot house and lantern. Both are described as having sloping sides—yet both could be retracted flush into the hull, leaving the deck smooth. For my design I adopted the compromise solution worked out by Nautilus scholar Michael Crisafulli, whose website is an absolute goldmine of Nautiloid lore and research.